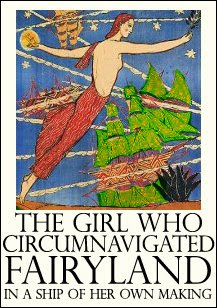 "The Girl Who Circumnavigated Fairyland In A Ship Of Her Own Making"
After many enquiries as to whether the fairy tale book mentioned in her (very) adult book, "Palimpsest" was real, Valente took it upon herself to bring it into existence. It turns out she really likes writing Young Adult fantasy! This is a book about a little girl named September who gets herself a ticket to Fairyland on the back of The Green Wind and a somewhat cranky Leopard. There she discovers the realm of the capricious Marquess and the dangers of the Perverse and Perilous Sea. It is going to be something else. In her blog, she talks about her process and discoveries as she writes it. She's also recording herself reading it and posting both the text of the chapters and the audio, week by week, podcast-style as the book is completed. It's completely free though donations are welcome. There are wonderful echoes of "The Orphans Tale" evident already, which should make for a rich, enjoyable experience for the reader/listener and one that stands the test of time.